Planning your river cruise holiday is exciting; you decide which river and destination you wish to explore, you even find a river cruise with the perfect dates that you wish to travel - you’re almost ready to book but now you need to choose a cabin! If you have never been on a cruise before the many types of cabins available may be confusing & you may be wondering what the difference is & if it’s worth upgrading to a suite. There are many things to consider before you choose a cabin for your river cruise, but fear not – we’re here to help make your decision easier! Which Grade of Cabin should I Choose? The grade of cabin you choose does come down to personal preference and even your budget. Cabin grades, sizes and amenities do vary by river cruise line - some river cruise lines operate all-suite ships and others offer a French balcony as the lowest grade (on these ships there is no choice of a cabin with only a small window). The size of cabin can range from a window stateroom with fixed twin beds at 109 sq. ft. to a masters suite with a separate living space, balcony and possibly two bathrooms at 620 sq. ft. The image shows examples of a standard river cruise cabin with a window. To the left of Emerald Waterways and to the right Tauck. Unlike Ocean Cruises, onboard a river cruise you will not find an inside cabin without a window - the lowest cabin grade you will come across is the standard stateroom with a window, but be sure to ask how big the window is and whether you can see out of it; sounds silly, but some windows are above eye level and while they provide day light, they do not provide a view of the delightful scenery (this is because your cabin is mostly below water level). These windows are not far above the waterline, they cannot be opened, nor do they offer a view of the stunning scenes that pass you by. 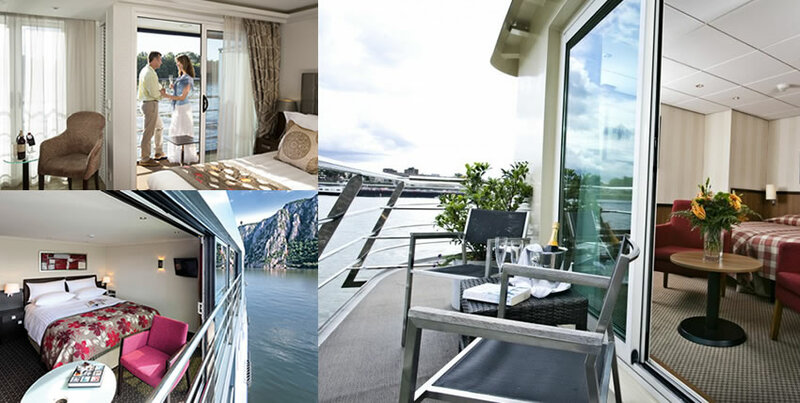 On the other hand, some river cruise lines provide a floor to ceiling panoramic window – providing a spectacular view! Others offer 2 twin windows - But as previously mentioned, the cabin grades vary across river cruise lines and their ships, so be sure to ask about the various grades available on your river cruise! Is the lowest grade of cabin small? – Again this varies depending on the ship – the standard cabin is the smallest size cabin available however, this should not put you off. River Cruise ships provide spacious cabins and the size does not always increase as you upgrade to a balcony cabin – be careful – upgrading to a step out balcony can take space away from the inside of your cabin! The image shows examples of a standard river cruise cabin with a balcony. Top left is AmaWaterways, bottom left is Avalon Waterways and to the right is also Riviera Travel. Now be careful here. Not all balcony cabins have a ‘step out’ balcony, many include a French Balcony - which comprises of floor to ceiling slide windows/doors which open to a safety rail. Those with a French Balcony are often of a similar size to those with a window (check with your river cruise specialist), but you can appreciate the gentle river breeze with a great view of the beautiful scenery. If you choose a step out balcony this may take some space away from the inside of your cabin BUT provides the added benefit of a private balcony where you can relax in comfort watching the picturesque river banks passing by. I suppose you have to decide what’s more important to you - more indoor space or an outdoor area where you can sit and watch the world go by? When choosing your river cruise cabin, you may come across what’s called a ‘twin balcony’ cabin – this is even the standard balcony cabin grade on many ships – within the stateroom you will find both a French Balcony and a step out balcony. Some river ships even have a few grades of balcony cabin, a higher grade of cabin often provides a larger and more spacious stateroom and is often found on a higher deck – for a small price increase it may be worth the extra space! How much space is there on the balcony? Most standard balconies provide enough room for two chairs and a table – enough room to sit comfortably and enjoy the view with a glass of wine. The image shows examples of a river cruise suite. To the left of Emerald Waterways and to the right Scenic Tours. It is worth mentioning here that there are various types of suites and they vary across the different ships, from junior suites, to master suites or owner suites - so please check out the cabin grades and floor plans of the ship you will be sailing onboard. Most suites include a step out balcony (but please check with your river cruise expert), many of which are larger than the standard cabin balcony. There is also usually more space within a suite than a standard cabin - a higher grade suite will have a separate ‘living area’ and larger bathroom – many of which include a bath tub. Before you book a suite, think about how much space you need, or would ideally like and what you can afford to spend. Remember your stateroom is a place you can go to escape everybody and everything. If you think you will be spending plenty of time in your cabin, relaxing on your balcony or even like to relax in the bath – a suite is definitely for you! Within each stateroom you will find the following - either 2 twin beds or a double (as requested), a good size wardrobe, a separate bathroom with a shower, a coffee table and chairs & a dressing table. The layout will vary depending on the cabin grade, and the amount of furniture may increase as you upgrade to a larger stateroom or suite – for example you are often provided with a bath tub when you upgrade to a suite. Each cabin will provide standard amenities such as a television, air conditioning, a phone, hair dryer and a personal safe. Many cabins also include bath robes, slippers, tea and coffee facilities PLUS free Wi-Fi. As you upgrade you are very often provided with added benefits such as a private butler, in-cabin dining options and free laundry services. Some people like to be close to certain facilities such as the restaurant or atrium, or on an ocean ship close to the lifts – but the size of a river cruise ship means that nothing is far away from you, wherever your cabin may be. The beautiful scenery – a cabin on a higher deck will truly provide a better view of the picturesque scenery that passes you by, from medieval castles to hillside vineyards you don’t want to miss out by having a cabin with only a porthole as a window! Should I choose a mid-ship cabin? Many of you may have heard that having a mid-ship cabin is better because you cannot feel the motion and movement of the ship & yes this is correct on a large ocean ship, especially those who are more prone to motion sickness. But a river cruise sails effortlessly along a river, you do not find large waves, providing a smooth and pleasant journey. Will I hear the engine from my cabin? It has been said that certain cabins on the lower decks towards the aft of the ship are closer to the engines and you may occasionally hear the engines, and that cabins just below sun deck can hear movement of deck chairs – If you are offered a choice it may be worth asking about the surroundings of the cabin or requesting not to be too close to a particular area. As you would expect your choice of cabin will affect the price of your river cruise – taking your budget into account think about where you are going & how long you are onboard for. Would you spend time on the balcony? Are you going to spend a long time in your cabin? Will you be using your cabin purely for sleeping and getting ready for your day or evening ahead? Having looked at other considerations such as the size of your stateroom, the amenities and the location of your stateroom hopefully you can understand that as you upgrade, you expect to receive good value for money (of course dependent on your personal preference). So which cabin should you choose? Well that’s down to personal preference! Looking for a great deal? Visit www.rivercruising.co.uk to find the right River Cruise for you! Think I’ve missed something or want to know more? leave a comment, let me know!